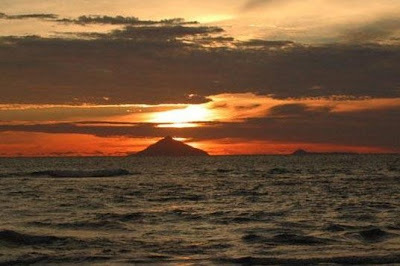 Mount Krakatau is located in the east of Lampung Province which is nine kilometers square in diameter. A great explosion on August 27th 1883 caused this 2.000 meters above the sea level mount became inactive for about 44 years before Mount Anak Krakatau emerged on December 1927. Now, Mount Anak Krakatau is at an altitude of 200 meters with two kilometers square in diameter. Now it is frequently visited both for research and tourism interest. Having a look around the mount from the peak is a memorable moment for you who love climbing. You will see the bluish scenery of Sunda Strait surrounding the mount. The emergence of Mount Anak Krakatau is an enticement for researchers to reveal the million mysteries of the mount containing so much mineral substances like volcanic bomb, lava, and lapilli overflow from the crater. It is the right place for having mountainous sports activities while enjoying the beauty of sea scenery around. Moreover, you may spend more nights at Sebuku Island or Sabesi Island. Mount Krakatau includes into the administrative area of South Lampung District. It is situated in Sunda Strait, amid Java Island and Sumatra Island. From Bandar Lampung City to Canti Beach in Kalianda, it will spend about an hour to reach the location. Then you need to carry on the trip to Mount Krakatau by taking speedboat of 20 people of maximum capacity. The costs range from IDR 200.000 to IDR 250.000 with approximately 1,5 hours.